Tempe Home Cleaning Done Right. Every Time. Move In/Outs & Deep Cleaning services only $59 more! 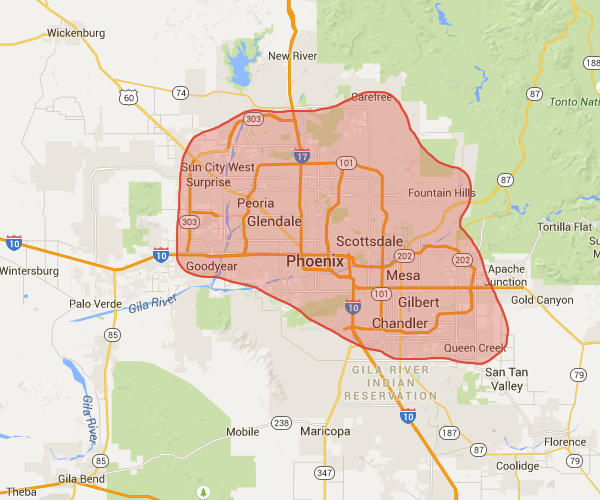 We service all of Tempe and Phoenix suburbs. If you aren't sure if we'll service your area please give us a call. Our company has been founded on the pillars of ethics and quality. All of the cleaning services offered by our company are done with friendly, professional staff, and quality cleaning tools, both of which contribute to a top of the line home cleaning experience. We have been Tempe's top source for residential cleaner for years, and we want to earn your business the same way that we've earned that reputation: by providing you with remarkable value and a cleaner home. Our agency is professional and specializes in a variety of residential cleaning services. Coming home to a messy house is like coming home to a second job. We want to help save you time, money, and hassle by taking on that second job for you. Large or small, there is no cleaning job too tough for our team. Cleaning your home is time consuming, not to mention tiring and difficult to fit into an already hectic schedule. Struggling Tempe residents are rejoicing over our house cleaning staff appearing on their doorsteps with all of their cleaning supplies in tow, ready to give local homes that fresh clean feeling, without the homeowner having to lift a finger. We're out to save Tempe residents time, energy, and a lot of frustration when it comes to their home cleaning. Our company doesn't just show up with the proper cleaning supplies for each job, we also make sure that each cleaner we employ is dedicated, friendly, and incredibly good at their job. We make sure that even though our cleaning services are incredibly thorough, all of them are affordable, giving you a professional clean that's easy on your bank account as well. Thanks to our professional cleaning services and our friendly team, your living room, kitchen, bedroom, bathroom, and all of the other areas of your home will be showroom ready by the time we leave. So you're probably thinking to yourself, what makes us different than those other cleaning companies out there? We come with a list of guaranteed promises that we hold to with each of our residential cleaning clients in Tempe. We always start with the affirmation that your home will be treated like we would treat our own. That starts with taking care of your furniture and personal items in your home, and continues on with our spotless cleaning service, which makes sure that every detail of your home sparkles. We supply our own quality cleaning tools, so that you can rest assured that we come prepared with everything we need to get your home in tip top shape. We strive for perfection, and in order to reach it, we know that there can be no such thing as 'surface only' cleaning. We clean the major parts of a room-like vacuuming, mopping, and wiping down surfaces-and then we get all of the nooks and crannies of each room. If you stick with our cleaning company, you'll become one of our regular, loyal Tempe customers, which means you'll get some great discounts from our company. We're all about communication. We use various forms of communication to provide our clients with the very best in customer service, and to ensure that each job is completed as specified by the homeowner. We don't leave a job until you're completely satisfied by your cleaning results. We only use professional, trained maids and cleaners, and they will be the only people entering your home, and we'll always let you know when they're coming. We always work from your specifications and special requirements so that we can make sure that all of your cleaning needs are met. If you don't want a certain room cleaned, an expensive vase moved, or anything else, we'll mark it down on our cleaning checklist and you won't have to worry about it. Our cleaning services are engineered to put a smile on your face. You can easily book a cleaning with us right here on our website if you like what you see! You can choose your services based on the size of your home, an hourly rate, or either with additional features. If you want to book over the phone, or you have additional questions or concerns about your next Tempe residential cleaning, feel free to check out our Contact page for other ways that you can get in touch with our cleaning company. Book your cleaning service today and get ready to come home to a sparkling home and a little peace of mind. I'm a realtor and always call Maid Complete when I sell a house. They come in and do a move-in clean for my client and they love it. After a recent accident I am no longer able to clean everything myself. They mop, sweep and vacuum everywhere. The kitchen is perfect and spotless. I thank for them for their help while I recover. Working at ASU I'm pretty busy during the day - not much time to clean. Every month I have MC come by and freshen everything up and vacuum and organize. No complaints at all!